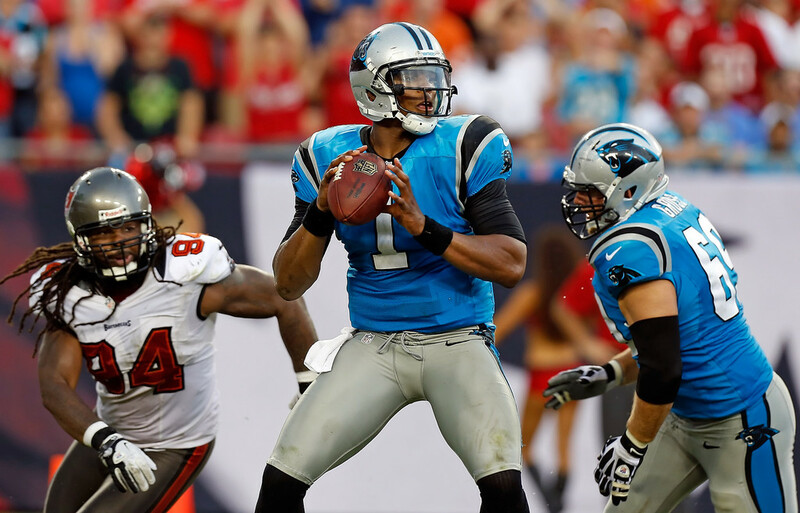 Cam Newton and the unbeaten Panthers head south this week to take on the division-rival Tampa Bay Buccaneers. Coming off their first divisional win last Sunday that ended up closer than the stats would indicate, the Panthers now travel to Tampa to face the league’s number one overall pick, Jameis Winston, and the Buccaneers (1-2). The Bucs have still yet to pick up a home win under head coach Lovie Smith and will be looking to do so against a Panthers team that continues to accumulate injuries. With Luke Kuechly (concussion) officially out another week, and DE Charles Johnson (hamstring) now out until at least Thanksgiving, Carolina will need rookies and role players alike to step into larger roles to maintain it’s #7 defensive rank. Expect more snaps from rookie linebacker Shaq Thompson this week, who’s seen increased playing time in every game thus far, and continues to impress. With Thomas Davis now listed as Probable with a shoulder injury, Thompson may even see a full slate of starter work – which is unusual for a player making the conversion from running back. He continues to learn at a fast pace however, making several crucial stops against the Texans and Saints that called for veteran instinct at the position. 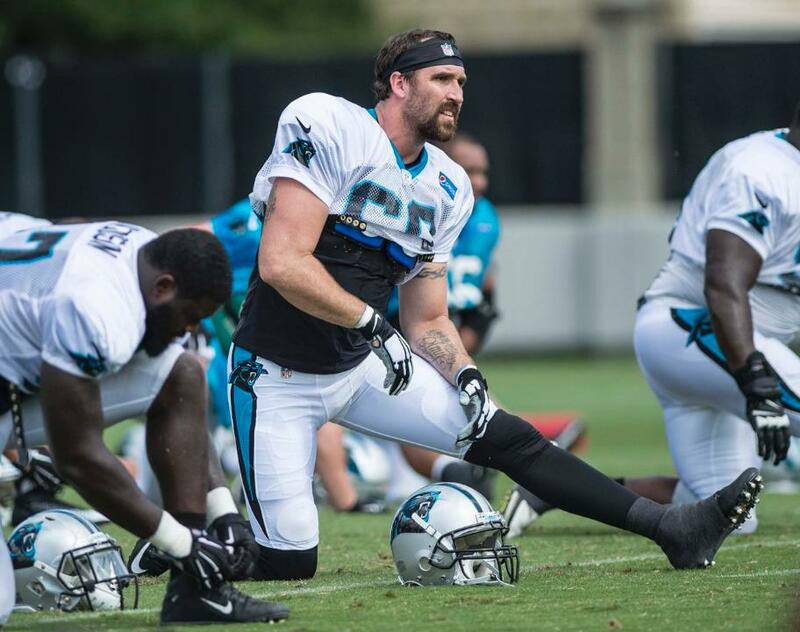 Also look for newly acquired DE Jared Allen to jump into the rotation right away, hoping to help a defensive line that’s underwhelmed through 3 games. 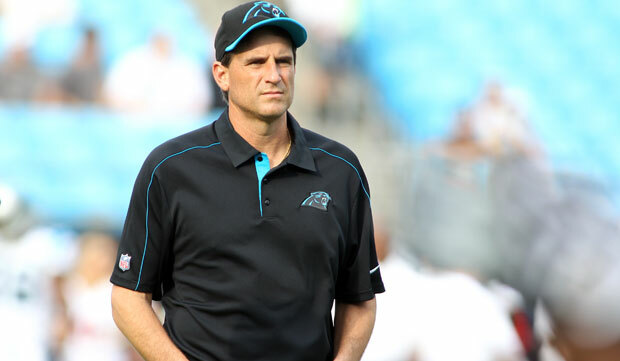 Although he just flew into Charlotte to join the team at practice this week, a pass-rusher as achieved as Allen is in a plug-and-play situation – as Ron Rivera noted in his post-signing press conference. Josh Norman continues to make a strong case for an All-Pro season, which I’ll dive further into later, but this week he’ll line up across from the biggest and most physical-styled receiver he’ll have seen so far this year. Mike Evans, while showing some rust coming back from a hamstring injury, still managed to top 100 yards last week in Houston, and Jameis Winston has shown an immediate trust in his top pass catcher, targeting him 17 times in the 19-9 loss to the Texans. He’s been a dominant force in the league since the Buccaneers selected him in the first round last season — and along with Odell Beckham Jr, a large part of why Kelvin Benjamin’s thrilling rookie campaign flew largely under the radar. Newton’s publicist has no doubt had a great workweek, while the quarterback has graced every national media outlet – for things other than sideline towel vogue. After leading Carolina to a 3-0 start, and commanding the offense both on the ground and through the air, he’s built himself a solid case in the early-season MVP race. I’ll say again that if everything continues as it does for 13 weeks (which almost never happens in the NFL), the MVP award is truly a two-horse race between Rodgers and Brady. But Newton is playing his best football of his career, which is great to see at a time when the Panthers Super Bowl window is beginning to open. There are two types of teams in the NFL: Those who have a viable franchise quarterback to rely on, and those who don’t – and the Panthers surely won’t find themselves in the latter for a while. While Carolina plays Tampa twice each year, the Buccaneers haven’t actually faced Cam Newton since 2013. 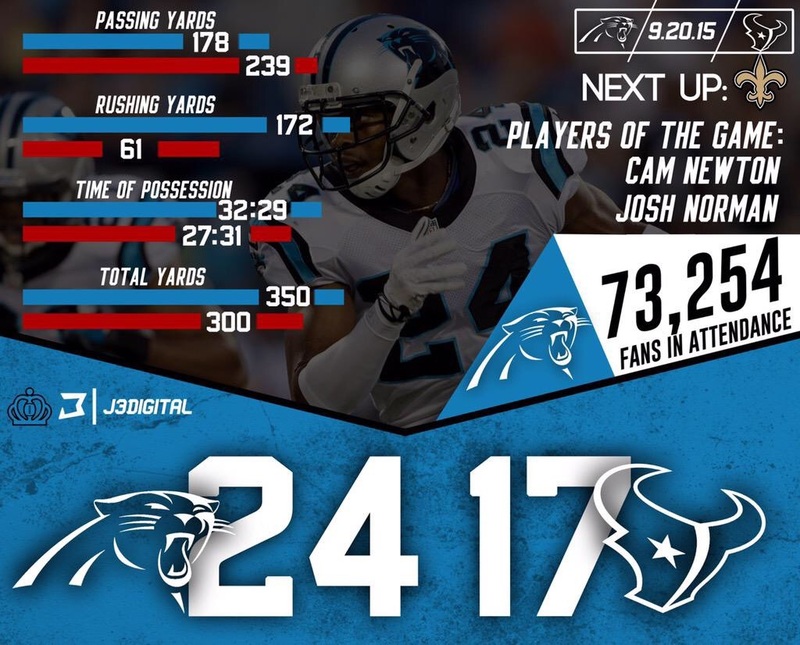 In their two meetings last season, Newton sat out with unrelated injuries – and watched Derek Anderson throw for a combined 507 yards and 3 touchdowns, en route to 2 critical wins. The Panthers start the season 2-0 for the second consecutive year, as they defeat the Texans 24-17 at Bank of America Stadium. One of the most conservative-minded individuals in football showed a different side of his playbook against the Texans, twice electing to take deep shots at the end zone on 1st & 10 plays — both of which resulted in touchdown passes. The second came directly after AJ Klein’s 4th quarter interception of Ryan Mallet, appropriating a popular strategy to gamble for a quick score after forcing a turnover. With no true number one receiver on the roster, he’ll need to continue this aggressiveness to put points on the board — especially throughout the Panthers’ next slate of games which includes 4 playoff contenders. More on that later. In his first contract season of a 4 year career full of ups and downs, Norman is stating an early case to be considered with the best cornerbacks in the NFL. Leading the strongest secondary that Carolina has fielded in years, he’s helped limit opponents’ top overall receiver to 60 yards or less and no touchdowns, for 9 straight games now. A list that includes Julio Jones (twice), Josh Gordon, Mike Evans, Jimmy Graham, Jeremy Maclin, and now Deandre Hopkins. Norman, who played high school football about an hour away from Hopkins in South Carolina, was on him for most of the afternoon and gave up 6 catches for only 40 yards – none for first downs. He’s quickly shot up the Pro Football Focus positional ranks through 2 weeks of top tier coverage, and will likely demand top pay when contract talks open up again after the season. With a pass rush that can’t seem to find a difference-maker opposite Charles Johnson, he’s helped transform this defense’s identity – turning the secondary from a glaring weakness to a game-breaking strength. Similar to his rookie season in 2013, when he got his first career start due to a Chase Blackburn foot injury, AJ Klein’s number was called again this week — this time to fill the shoes of the league’s leading tackler. 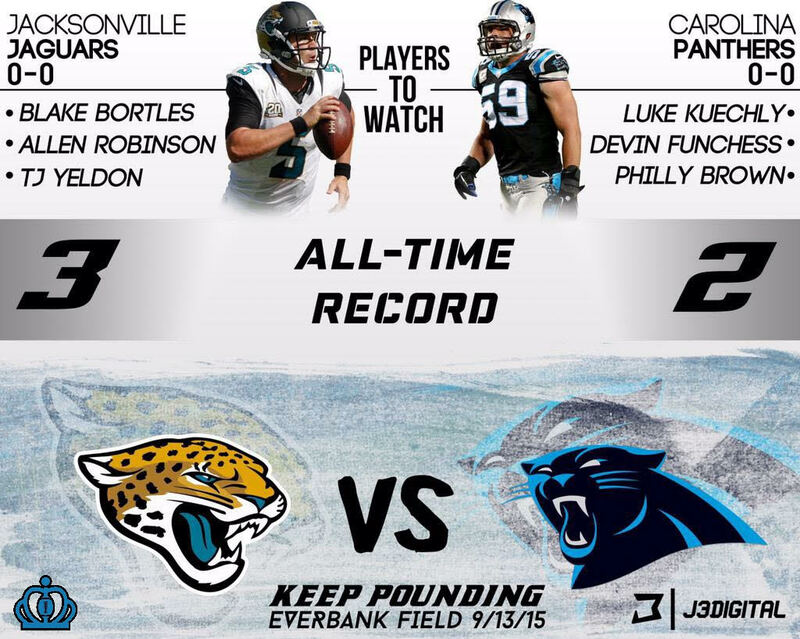 After Luke Kuechly suffered a concussion late in the first half of last week’s contest in Jacksonville, Klein stepped in at middle linebacker and led an defensive performance that only allowed 75 second-half yards — and never let the Jaguars offense cross midfield. 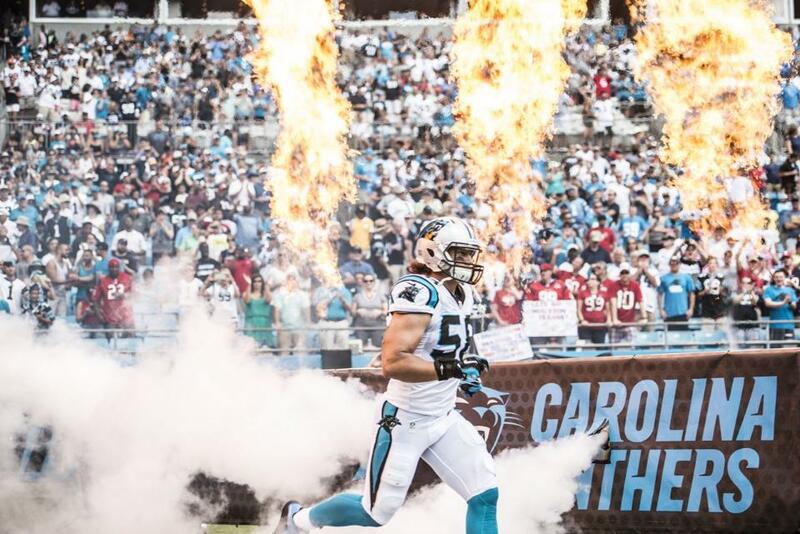 Earlier this week he learned that he would get the start in Kuechly’s void, and once again exceeded expectations. The 5th round pick out of Iowa State, who knows all three linebacker positions, recorded a momentous late game interception that led to 7 immediate points and Carolina’s largest lead of the game. Having a versatile 4th linebacker on the roster who can step up when called on is exceedingly valuable to this defense, as well as Luke Kuechly’s long-term health. From the game film that he’s laid down, to the leadership beyond his years that he’s provided, its safe to say that there are several teams that could use Klein’s full-time services. 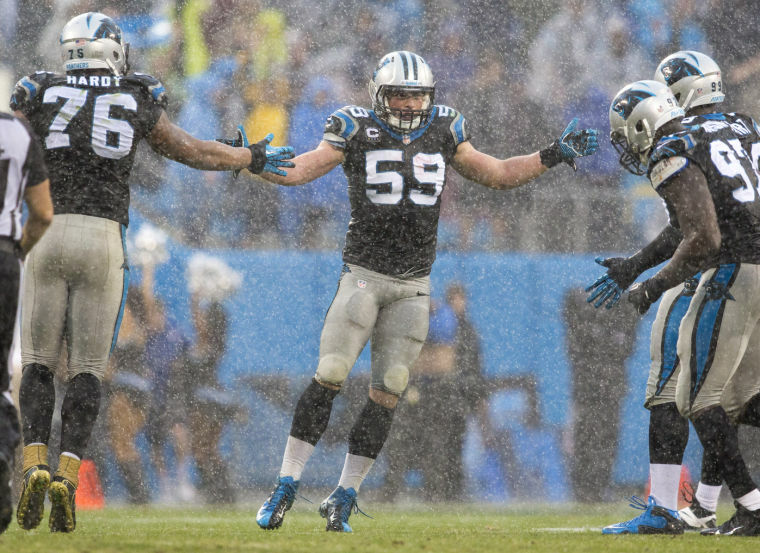 But with Thomas Davis in his 11th NFL season, and the depth that Klein has afforded the defense, he’ll likely have his contract extended before any teams get the chance. The Panthers enter division play for the first time in 2015, as they’ll play host to New Orleans at Bank of America Stadium on Sunday. The Saints will be looking for their first win of the season after a tough home loss to Tampa Bay, in which they allowed the Buccaneers to rush for 139 yards — the same total that Carolina’s ground attack is averaging through 2 games. Free agent acquisition CJ Spiller, who underwent knee surgery early in training camp, only saw 7 snaps in his highly-anticipated Saints debut, and will arrive in Charlotte to face a much stingier defense — one inside the top 10 in all major categories. This marks the second consecutive season that the Panthers have started 2-0, and the only two in the Rivera-Newton era. Dating back to the start of last December (including playoffs), the Panthers are 7-1, with an undefeated record at home. Frame it any way you like, every major media outlet paints its own narrative anyway, but starting an NFL season with 2 wins gives a franchise a 63% chance at playing January football. Carolina’s biggest obstacle looks to be the division-rival Atlanta Falcons, who find themselves in the same percentile, and have looked strong in the process. The two teams face off in weeks 14 and 16, both of which stand a chance to have major playoff implications attached. Of course, the Panthers will first have to get through a brutal slate of games over the next 6 weeks — one that includes perennial playoff contenders in the Seahawks, Eagles, Colts, and Packers — for those two late Atlanta matchups to have much meaning. There’s a reason that the day immediately following the first slate of NFL games is referred to as Over-reaction Monday. 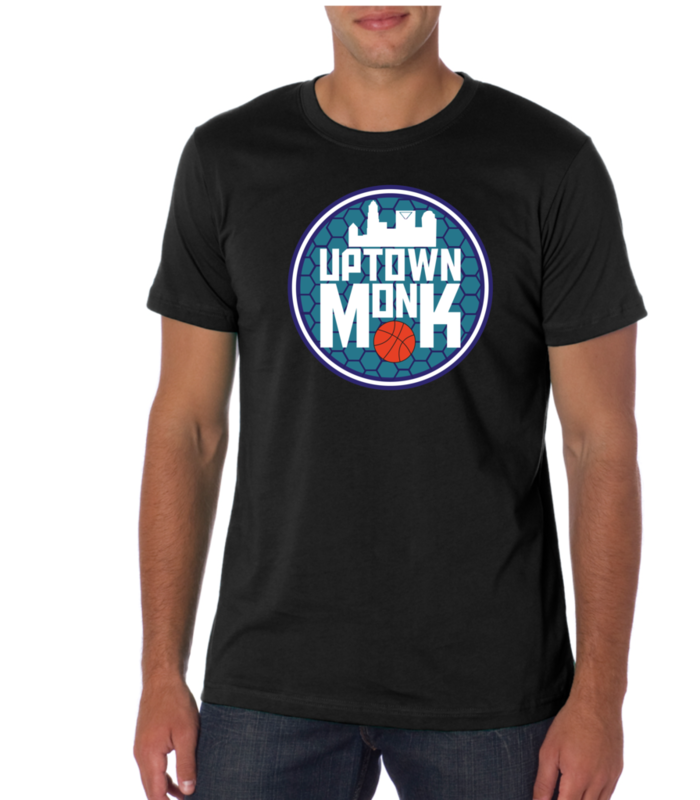 The casual fan likely watches their favorite team play, or whatever game was broadcast in their market, and later begins to skim the rest of the league’s box scores. While a win in this league is worth it’s weight in gold, scores and stat lines aren’t always a telling indication of a team’s outlook going forward – or where it sits in the current landscape among others. In week 1, the Seahawks lost to the Rams, Adrian Peterson only rushed for 31 yards, and Peyton Manning didn’t throw a single touchdown. All shocking realities you may have noticed in the score section – but none necessarily any cause for concern. As it relates to the Panthers, Cam Newton’s stat line of 175 yards, 1 touchdown, and 1 interception is unimpressive by any measure. 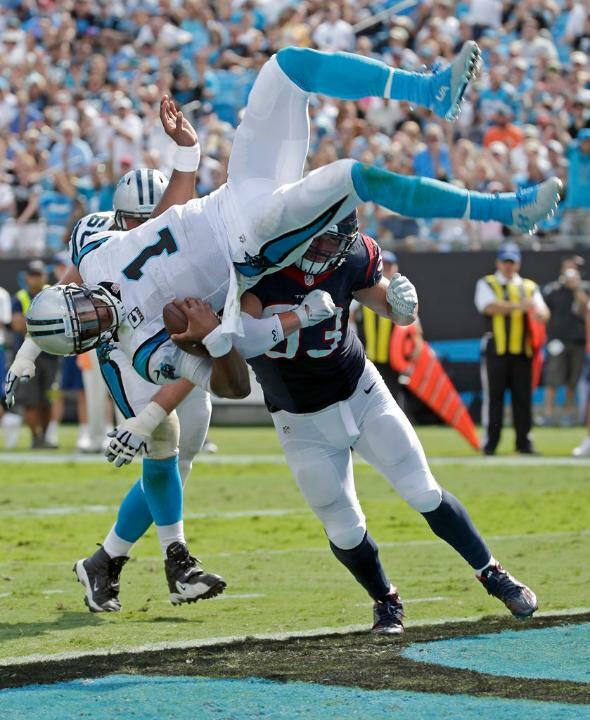 But the film reel would suggest that if not for a questionable pass interference call on Greg Olsen’s would-be touchdown, and an inexcusable drop by an end zone-bound Ted Ginn – Newton is looking at a much more appealing 214 yard, 3-score outing. 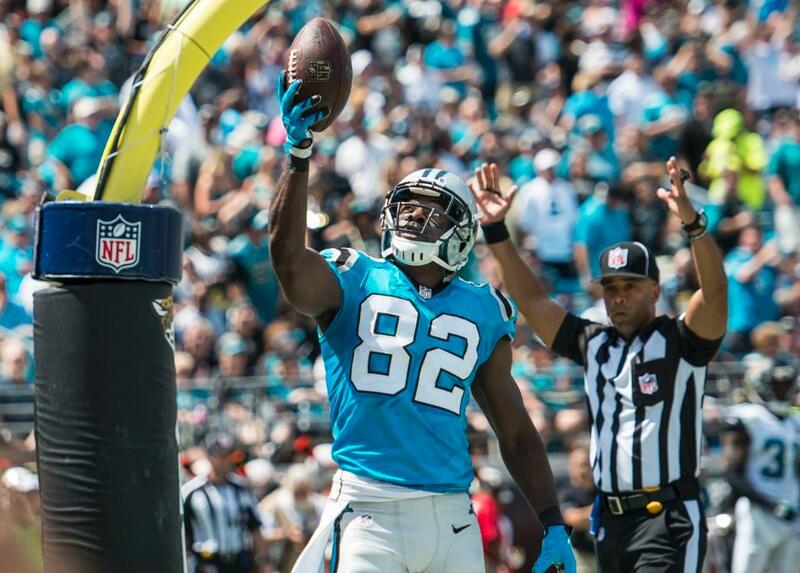 If you’re looking for any hope in the realm of this season’s Carolina pass catchers, there may be reason to look to Jerricho Cotchery. While the 12th-year veteran’s most valuable asset comes off the field in the form of mentoring, and you won’t see him beating any top corners this late in his career — he still possesses the sure hands and precise route-running ability that allowed him to catch 10 touchdowns with Pittsburgh just two years ago. He put that same route running on display in Jacksonville last week, as he went for Carolina’s only offensive score of the game. It was his supreme understanding of NFL defenses, as well as some timely footwork, that found him wide open in the end zone late in the first half. On first and goal from the Jaguars 7, the Panthers line up in the Shotgun, with 2 wide receivers Left and Jerricho Cotchery the lone receiver on the Strong side (bottom of frame). He motions toward the middle of the field and settles on the “10”, where he’ll begin his route. Notice both Greg Olsen and Jonathan Stewart drive their routes outward toward the right sideline, taking the outside linebacker and cornerback with them. Without top-wideout Kelvin Benjamin this season, the Panthers will need their remaining pass catchers to step into greater roles than they’ve seen in the past — and with Greg Olsen tasked with blocking all-world defensive end JJ Watt this week, don’t be surprised if the veteran Cotchery sees more targets than usual; Especially in the red zone. In a week that saw the NFL break more off-the-field news than on, fans and players alike are eager to line up and kick off the 2015 season. And while that was officially done on Thursday night, as the Patriots beat the Steelers 28-21, Carolina will embark on a title-defense of its own tomorrow, against the Jacksonville Jaguars. *4 within current alignment, 1 NFC West Title (1996). **Both titles from defunct AFC Central. It’s evident that Carolina has seen the more successful start, but they find themselves limping into this Week 1 matchup – on a day that all records stand even. An offseason that included season-ending injuries to number one wideout Kelvin Benjamin, and vital rotation piece Frank Alexander – the Panthers will look for new faces to take on greater responsibility, no different than standout rookies Bené Benwikere and Tre Boston did in last season’s playoff push. Jacksonville is no stranger to injury woes, having lost two marquee players in Julius Thomas and Dante Fowler Jr.
Thomas, a blockbuster free agent acquisition from Denver, fractured his right hand in his first preseason action in Jacksonville, and will miss the first month of the season after a necessary surgery. Fowler, the Jaguars #3 overall pick, suffered a torn ACL in his very first practice following the draft. 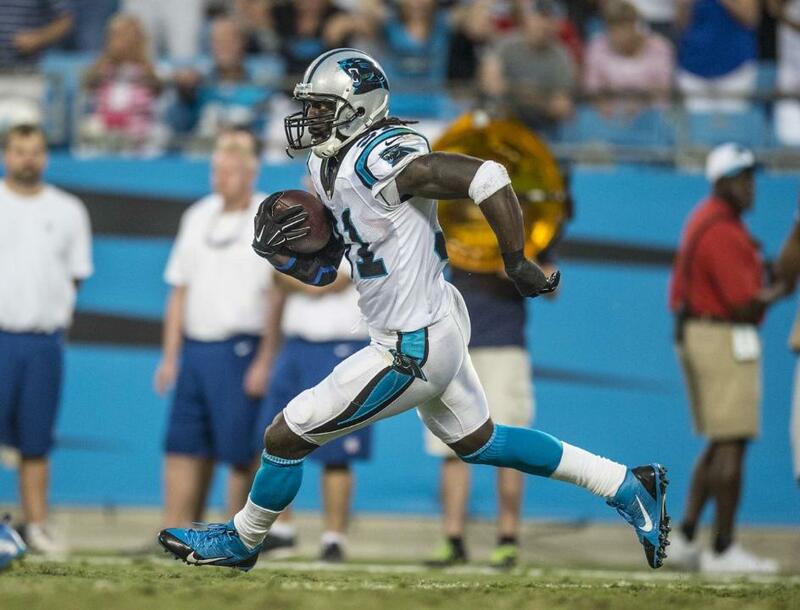 This season’s Week 1 Defense will include only one defensive back who started last season’s opener, in Roman Harper. 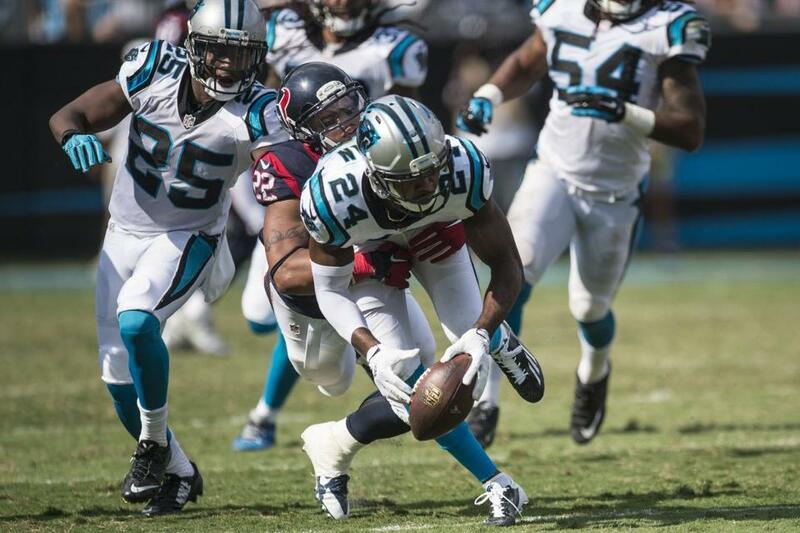 The other three: Melvin White, Antoine Cason, and Thomas Decoud – have all been released from the team. Until Star Lotulelei returns, the Panthers won’t boast the elite defensive line that they’ve fielded in years past – so this new-look secondary will need to step up if the group plans to return to Top 10 prominence. 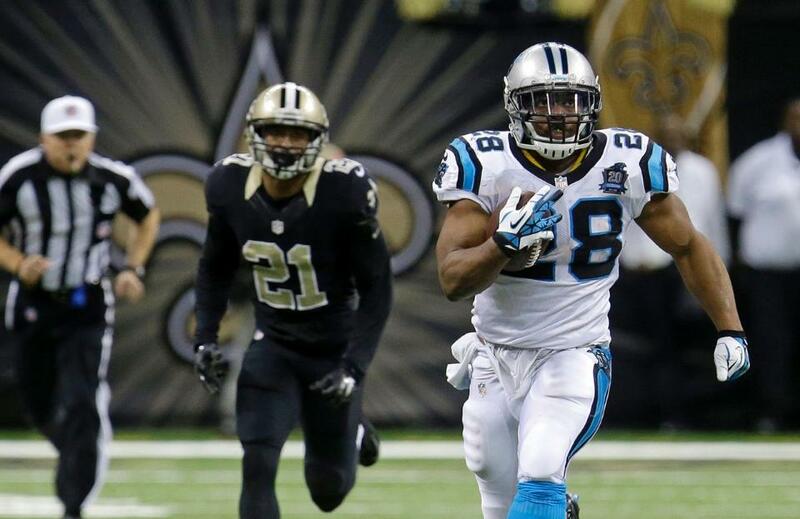 Over the final 6 weeks of 2014, including playoffs, Jonathan Stewart laid down a stat sheet second to only Marshawn Lynch – and looked on film to be one of the most exciting rushers in the league. Monster games against the Saints, Browns, and Cardinals (in which he rushed for over 120 yards each) led the way to an average of 5.1 yards per carry – and helped propel the Panthers to a division title and playoff berth. If he can pick up where he left off, Stewart has the chance to lead this Carolina offense in a fashion that it desperately needs after losing Kelvin Benjamin. Although Ron Rivera noted this offseason that they’d like to limit him to the neighborhood of 15 carries per game, he’s shown that he still has the ability to take over a series, and they won’t steer away from him if he starts rolling. Look for him to get out to a hot start against a Jaguars defense that gave up an average of 127 yards on the ground last season. On the third week of the 2011 season, Cam Newton & Ron Rivera’s rookie year, the Jaguars traveled to Charlotte for a game that featured a torrential downpour, much like that of the memorable 2013 matchup with the Saints. With the Jaguars in the lead for much of the second half, Cam Newton drove down the field with 4 minutes left to play – and completed both a touchdown pass and 2-point conversion to Greg Olsen, notching his first game-winning drive and first career win in the NFL. The game also featured an incredible catch-and-run by Jonathan Stewart, which was called back – noted here by David Newton. You can watch the null-and-void Stewart play here. Follow Austin on Twitter @Austallings for Breaking News, Injury Updates, and General Football-oriented Rants.